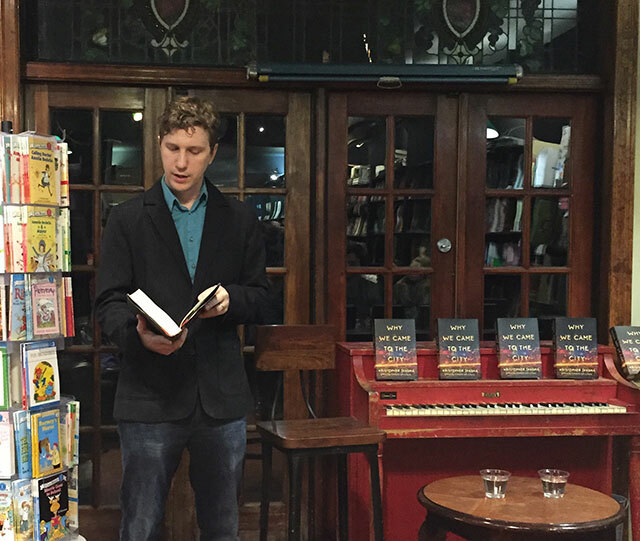 Kristopher Jansma’s debut novel, The Unchangeable Spots of Leopards explored the competition and jealousy of two close friends during their formative years. His latest novel, Why We Came to the City, dives into the complications of a group of friends as their relationships mature, and perhaps even, outgrow each other. 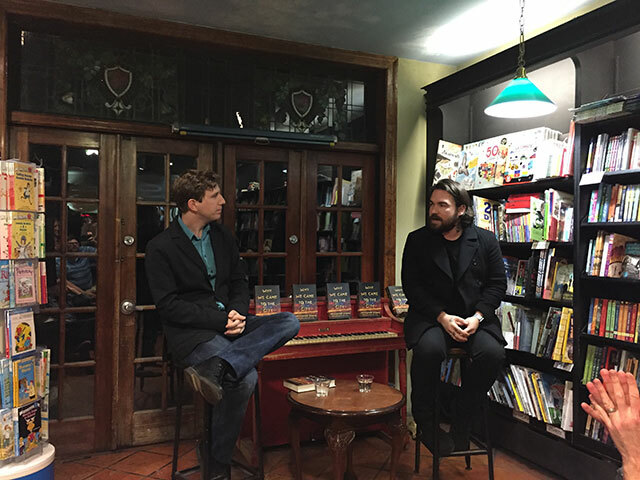 He was joined by Isaac Fitzgerald, books editor at BuzzFeed, to discuss the novel at Community Bookstore in Brooklyn. Why We Came to the City features five friends who each share the novel’s point of view. They have known each other from college and remained friends because of their proximity in the city. But as the novel opens, their relationships face the complicated fact that perhaps they have begun to outgrow each other. Fitzgerald begins the discussion by asking about the poetry of the novel. Jacob Blaumann, one of the friends, is a poet who an acclaimed poem in his youth. He now finds himself unable to replicate that success. More than Jacob though, poetry is referenced and an influence on the novel as a whole. “I’m an awful poet,” Jansma says. Nevertheless he does have an interest in epic poems. Jansma teaches college level English courses, and he says poems like The Iliad, The Odyssey, and The Waste Land were all big influences on the novel. While Jansma was in college, a professor taunted him by claiming that because poetry was harder to write than fiction, it was by definition, better. He was riled up by the comment until his college roommate pointed out that peeling an orange with toes is fundamentally harder than peeling it with fingers, but that doesn’t make it better. Despite the presence of New York City in the novel, Jansma does not see it as a sixth character. The city is simply there, he says. It is not trying to interfere, it is not trying to help you or hurt you. Like his characters, Jansma moved to the city just as he was maturing. He grew up in New Jersey, and was applying to graduate schools when Columbia called. One professor told him there were members of the admissions committee who did not think he was ready to come. When Jansma arrived at Columbia, he felt ready for the MFA but not quite for the city. He had spent time in Baltimore during college and says Baltimore is a much different city than New York. There was a long time where his entire New York City universe was the few blocks between his apartment and the Columbia campus. Once a week he would have dinner with a friend and afterward, because they had so little money, they would watch television in one of their apartments. Brooklyn, he says, was a still a kind of “there be dragons” place. One of the characters of the novel, Irene, is diagnosed early in the novel with cancer. Jansma drew on his personal experience when it came to this character: his sister was diagnosed with cancer. His sister eventually stayed with Jansma and his fiancee on the couch while she sought treatment in New York City. Both of Jansma’s novels are broken up into two parts. He says this design offers a kind of mirror effect where the two sides of the novel reflect each other and allow for comparison. He says the structure came naturally and was not something he planned out. Jansma focuses on characters when he writes. He says that focusing too much on plot and theme leads to many cliches. He also wanted the story to focus on these characters rather than their parents. So in Irene’s case, her parents are particularly absent even though she is enduring the trauma of cancer treatment. Jansma is just a few years older than his characters putting him very close to their own experiences. Whether he will keep writing about young people though is uncertain: “I don’t know what I’m hoping I’m writing at 45,” he says.